Many years ago the Air Force was testing clear air turbulence. They used one of their bombers (a B52) and they were flying near the Rocky Mountains in Colorado. When strong winds blow, it is like an ocean wave breaking on the downwind side of those mountain ridges. They found some extreme turbulence and it knocked off the vertical stabilizer. They made it back OK but I think that ended their testing. Note that the B52's design is quite different and that a good size piece of the VS remained (enough to provide significant lateral stability). 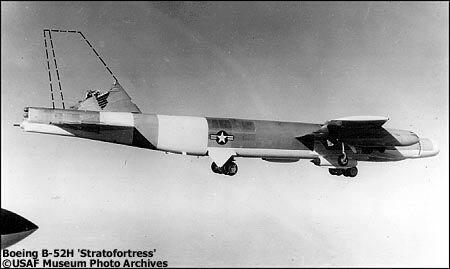 The B52 also had the wing mounted much further forward, hence the whole fuselage acted as a stabilizing force (the feathered arrow effect). The A300 is just barely stable without the fin, with the wing mounted further aft the pitching forces ahead of the center of rotation are about the same as those behind the center of rotation. If the A300 fin departed while any amount of rotation was going on, the forces would have quickly spun the aircraft in the previously described "flat spin". The witness statements generally do not support the complete separation of the tail assembly at 2400 feet as the NTSB asserts. Many Rockaway witnesses insist the plane had it's vertical stabilizer present and Witness Kenny Good saw it separate after the right engine broke free. What is possible is that the rudder began to break apart (it broke into 5 pieces that were retrieved from Jamaica Bay by the NYPD Harbor Unit and photographed by the Coast Guard) and the vertical stabilizer may have partially broken off at 2400 feet. Also, John Power has been adamant since the accident that the flat spins occurred while the vertical stabilizer was still on the plane. His testimony is here. Please jump to the U.S.Read Home Page where you will see more links to Flight 587 stories. Submit your email to the Editor. Please provide your full name, city, and state. Thanks for your comments!